Published: Jan. 18, 2019 at 12:32 p.m.
Want to see the numbers behind the numbers? Nick Shook dives into a fresh batch of Next Gen Stats and identifies figures that could shape Championship Weekend. 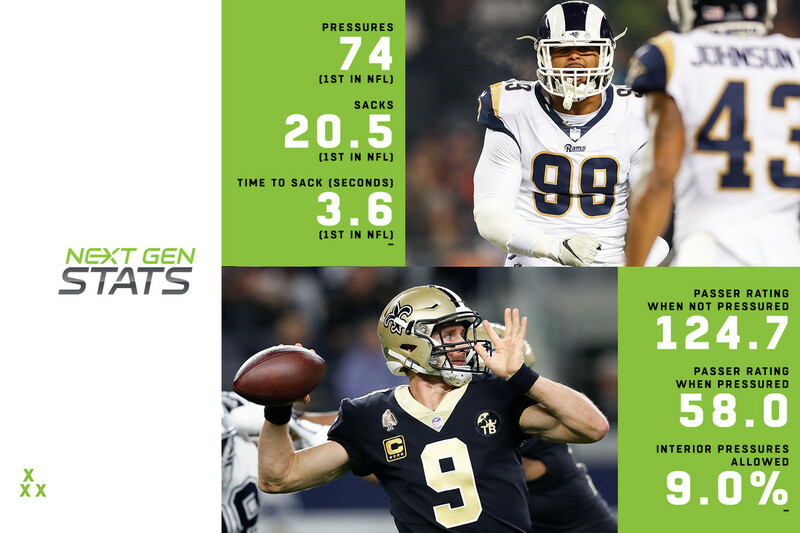 Aaron Donald, a legitimate MVP candidate, has led the Rams' interior pressure effort, generating a pressure on 13.5 percent of pass rushes (highest among interior DL, minimum 400 rushes). Los Angeles has posted a 17.1 percent pressure rate on interior rushes as a result, the highest mark in the NFL. Donald ranks first in pressures (74), sacks (20.5), sack percentage (3.7) and time to sack (3.6 seconds), and third in pressure percentage (13.5). Drew Brees has struggled under pressure in 2018, having the third-largest drop off in passer rating when under pressure (124.7 when unpressured, highest in NFL; 58.0 when pressured, making for a 66.7 difference). But he also has a line keeping him from pressure, allowing a pressure on 18.5 percent of dropbacks (third-lowest in the NFL), and allowing a pressure rate of just nine percent to interior rushers. This game, then, should come down to stopping Donald. New Orleans didn't allow a sack by Donald in their regular-season meeting. Drew Brees made his living in 2018 off getting the ball out quickly, averaging a time to throw of 2.59 seconds (third-quickest in NFL), and excelled on such throws, tossing 18 TDs, three interceptions and posting a passer rating of 117.2. His completion percentage of 79.7 on quick throws was second in the NFL, as was his passer rating, while his touchdowns (18) and yards per attempt on quick passes (7.6) rank third and fourth among 33 qualifying quarterbacks. Jared Goff, meanwhile, has a slower release, taking 2.94 seconds to throw on average (fifth-slowest in NFL). Brees is running into a tough matchup against the Rams' defense, which has allowed a passer rating of 86.5 (fourth-lowest in the NFL), seven touchdowns and eight interceptions on quick throws. Goff has taken 2.5-plus seconds to throw on 74.7 percent of all attempts (highest in NFL). This game should come down to the longer throws, as New Orleans' defense has allowed 18 TDs and a 90.3 passer rating (15th-highest in NFL). Mark Ingram and C.J. Anderson are similarly statured wrecking balls of running backs (though Ingram might take offense at this), both standing at 5-9 or less and weighing 215 pounds or more. They're also two of the most efficient running backs in the NFL. Anderson is tied for the lead among all running backs the last two seasons in rush efficiency (shortest distance traveled per rush yard gained), traveling just 3.4 yards per rushing yard gained. Three spots below him and tied for second is Ingram at 3.5. In case the tape didn't prove it, the numbers do: Anderson and Ingram are north-south runners who carry the ball like runaway trains. Tom Brady has been pressured on just 17.8 percent of dropbacks (lowest rate in NFL), and has received an edge pressure on just 9.9 percent of edge rushes (lowest in NFL). Kansas City generates a lot of its pressure on the edge, owning a 19.8 percent rate on the edge (second-highest in NFL) and featuring Dee Ford, who leads the league in turnovers caused by pressure (11). Brady is effective under pressure, though, throwing nine touchdowns when pressured (tied for second-most in NFL) and posting a passer rating of 88.5 when under pressure (tied for fourth-highest in NFL). Considering these numbers, the Chiefs will have to rely on interior defenders (such as Chris Jones) to generate pressure, a tall task against New England's excellent offensive line. The Chiefs succeed, in part, because they can air it out with the best of them. Patrick Mahomes has thrown deep on 15.1 percent of his attempts, the third-highest rate in the NFL. He averages 2.7 yards of target separation on deep passes (most in NFL) and threw 13 passes on such attempts (tied for first in NFL). The Patriots have allowed just 24.2 percent of deep targets to be completed this season (lowest in NFL), a 66.3 passer rating on deep targets (fourth-lowest in the NFL) and just 1.6 yards of separation per target on deep passes (second-lowest in NFL). But those are the comprehensive numbers. Against Kansas City in Week 6, they allowed Mahomes to complete 3 of 5 deep passes for 169 yards and two touchdowns. Alex Smith was similarly effective in Week 1 of 2017, completing 3 of 4 deep passes for 178 yards and two touchdowns. The last QB to toss two touchdowns on deep passes vs. the Patriots prior to Mahomes: Philadelphia's Nick Foles in Super Bowl LII. The slot has proven to produce plentifully for the Chiefs in 2019. Patrick Mahomes has targeted receivers aligned in the slot on 35.4 percent of attempts (third-highest rate among 33 qualifying QBs). Tyreek Hill and Travis Kelce are the only two players to gain more than three receiving yards per route aligned in the slot in a season since 2016, with Hill covering 29.4 yards of distance per slot route and catching the most touchdowns from the slot (nine) in a season since 2016. Opponents have attempted a similar approach against New England, but the Patriots have done well, allowing just 2.5 yards of separation per slot target, the lowest mark in the NFL. Much of this is due to the play of corner Jonathan Jones, who spends 68.1 percent of snaps in the slot. Whether Kansas City finds success in this matchup will go a long way toward determining the outcome Sunday. A massive part of New Orleans' and Los Angeles' success in the last two seasons has been the play of their dynamic running backs: Alvin Kamara and Todd Gurley. Gurley leads all running backs in the most 15-plus mph rushes with 89 in the last two seasons. Kamara isn't far behind, landing third with 77 such rushes. Both teams take advantage of their athleticism, moving the backs from the backfield to the slot at least 10 percent of the time (Gurley, 10 percent; Kamara, 11 percent), but Kamara spends much more of his snaps out wide (12 percent) than Gurley (3 percent). Kamara was targeted at a much higher rate, too, receiving 105 targets on 319 routes run (32.9 percent of routes), the second-highest rate among 21 running backs with at least 50 targets. Gurley, meanwhile, was targeted on 20.9 percent of his routes run.